We just announced a new bulk sales opportunity for our new “Uwingu Daily Space Explorer”—an inspiring and beautiful space exploration daily image delivery subscription. 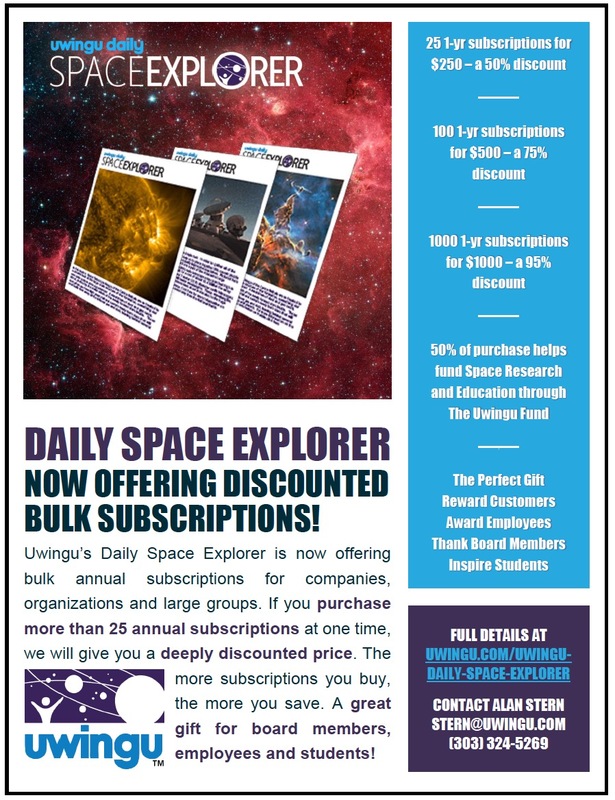 Bulk sales of Daily Space Explorer are deeply discounted. This offers clubs, companies, schools, and the ability to use it as a membership perk, to reward employees, or to thank advisory board members, or as an incentive/gift for good customers. Sales discounts on Daily Space Explorer start with bulk purchases of as little as 25 units, and extend upward past 50,000. Each Daily Space Explorer subscription sends the subscriber a year of daily electronic, high-definition space and astronomy images, each with an accompanying detailed, informative caption. The images curated by space and astronomy experts at Uwingu. Each caption contains links to even more information for those who want to explore further. Every image has an associated discussion page at www.uwingu.com to share thoughts, ask questions, and discuss with other subscribers and Uwingu scientists. “Our discounted bulk sales let clubs and corporations, teachers, and even advocacy groups inspire and incent their staff, their members, their students, or their customers with beautiful images of space missions, space personalities, space history, the planets, and the far away cosmos. It’s out of the box and out this world!” said planetary scientist and Uwingu founder Dr. Alan Stern. Like all Uwingu projects, fully half of all proceeds from corporate Daily Space Explorer sales contribute to The Uwingu Fund, which funds space research and education grants to space researchers and organizations. Want to talk about Bulk Sales for your group? Click here, and we’ll get in touch with you to discuss the options.